November 30, 2008 In News What is Michelle doing now? The Volvo Masters, the 21st and ultimate Grand Finale to be held at Valderrama was celebrated 30th October – through to the 3th of November. Michelle was at Valderrama covering the tournament. The tournament was won by Danish Golfer Soren Kjelsen, who was absolutely ecstatic on the 18th, finishing at eight under par. Even though the tournament suffered from rain that stopped and started play, the final afternoon was basked in Andalucia’s best sunshine. 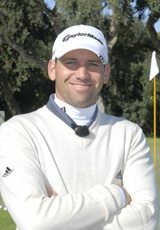 Michelle Chaplow and journalist Shenai Martinez, caught up with Sergio Garcia in Sotogrande and produced an exclusive interview and photographs of this extremely talented Spanish Golfer, at this moment Sergio is ranked number three in the world. A new tapas book, “A bite of Spain”, written by award winning cookery authour Janet Mendel, designed by Cheryl Gatward and published by Santana books with photography by Michelle Chaplow has just gone to press. The project has taken almost a year to complete. Half of the shots were taken in Michelle’s, state of the art studio, while the other more complicated recipes were shot at La Menorah Finca Cortesín and specially prepared by their chef Francisco. This is a huge tall man whom they call “Peque”, which means “little one” in Spanish. Michelle and her assistant also hit the road travelling to San Sebastian, Madrid, Barcelona, Seville, Ronda, Jerez and Malaga photographing and sampling tapas throughout Spain. Michelle commented, “I love the tapas lifestyle. These great little gastronomic delights simultaneously provide you with socialising and a chance to get to know this rich and varied land that is my adopted home, Spain. The Spanish bilingual publication On Live Magazine will feature the famous Loy Kathrong Full Moon Festival in Bankok in texts and imagery by Michelle Chaplow. The festival features numerous festivities including floating handmade leafcups lit with candles down the river at night as well as beauty pageants, cultural activities and a wide array of celebration events. This year Loy Kathrong is celebrated on November 12th. Michelle has been commissioned to carry out a photographic shoot for a luxury hotel in Kiev. The work will be carried out in early 2009. These commercial images will serve as publicity for the hotel and also for a book published by Famous Hotels of the World. 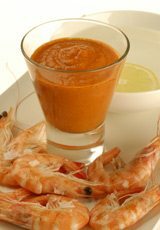 Tapas, prawns with romesco sauce.